“The drama! The chills! Repeat.” An oldie but goodie, this video won the most recent “Day in the Life” video content of the American Association of Law Libraries. ~ 1 minute. “Meet the Yale librarian behind he exhibit and learn about his philosophy of book collecting.” Si, hablamos español! Or at least Mike does. ~ 5 minutes. 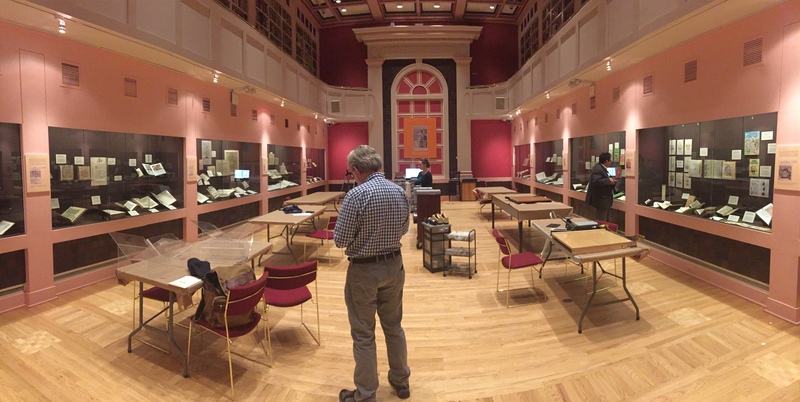 “On the hunt, the curators visit the New York Antiquarian Book Fair. Come along and experience the passion that drives book dealers.” ~ 10 minutes. All videos are opened-captioned for the deaf. Each functional purpose shapes the conversation between an illustration and its accompanying text. Illustrations that symbolize the law, for instance, often appear as frontispieces, at the start of the book, where they represent its underlying ideals, and they acquire full meaning only as the text of the book unfolds. By contrast, image that depict specific legal rules typically are placed directly next to the text they illustrate, and they are concrete and particular rather than abstract and symbolic. Illustrations that satirize the law lift readers above the language of the text—indeed, they often poke fun at legal language itself. For a press release about the exhibit, see here.